The pump used is engineered for our Vapor Blast systems – other OEM’s use no pump or one that’s off the shelf and not designed for vapor blasting environments. The Texas-born Dustless Blasters have no pump OR water tank – this means each time you fill their tank with abrasive you also have to fill it manually with water and Hold Tight. Have you ever tried to lift a 5-gallon pail of water, over and over again? And don’t forget the amount of time it takes to fill the pail each time. 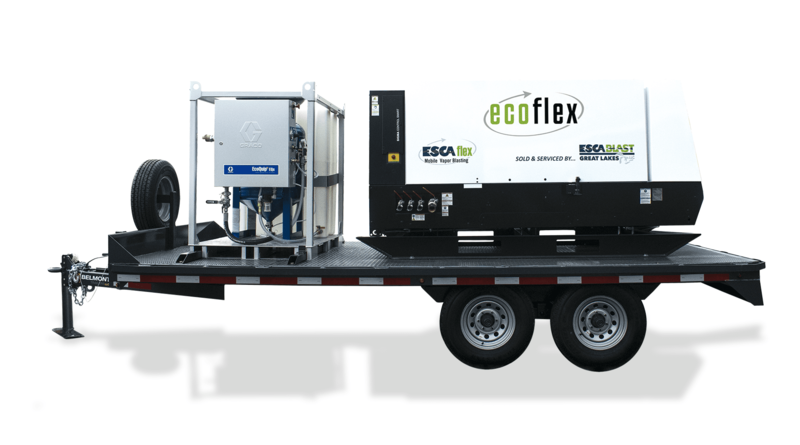 Our EQs Trailer Unit model comes with an onboard water tank large enough to hold enough water for a full day of blasting. This also means you only need to add Hold Tight once a day during start up — a big time saver. Have you ever seen what it takes to empty a “Texas-born” Dustless Blaster? They actually recommend just blasting out the leftover media if you are in a hurry (that gets expensive and messy quickly! ), and if you have more time then you need to disassemble the bottom valve assembly using tools (very time consuming). Our systems use a simple clamp on the bottom of the vessel that can be undone with no tools. This is critical – in today’s world of blasting, no two jobs are the same. Although today you may have only needed to use crushed glass, tomorrow’s job may require something harder like Jet-Mag. The EQs Trailer unit has the ability to quickly empty the vessel and easily contain the slurry mixture as it drains out. You would expect all OEM’s to coat the inside of the vessel, especially since it is in constant contact with water and abrasive. Well……. believe it or not, some don’t. Our machines use an advanced 2 coat system that fully protects your investment inside and out, ensuring long life and low maintenance operation. We consider the air compressor the “heart” of any blast system – ESCA only offers the Kaeser brand for a reason. We’ve had experience with most of the other well-known compressor brands, and have found Kaeser offers the highest quality engineering, reliability, and fuel efficiency available today on the market. The trailer is an easy item to overlook when shopping for a mobile blast system but just as critical as everything else – you need to be able to haul “weight”. Once you add water to the slurry system, load media you need for the job, and factor in the air compressor, all of a sudden you are going down the road with a lot of “weight”. Our trailer is rated for heavy-duty hauling and designed to hold up to the rigors of a “blasting” environment. Expect many years and miles from our trailer, as you will not have to worry about it being “maxed” out even when you load it up and hit the road. You can fit everything onto an ESCA rig, including up to 1+ton of media AND hoses, tools, etc. Our trailers are made in the USA, offer dual axle construction AND a solid, 1/8″ thick steel tread plate welded on all sides and seams. Our most popular option is a lockable, aluminum-body storage “box” that is mounted onto the front of a trailer. This box is BIG and designed to hold media and any other items of high value that you don’t want to get lost, wet, or stolen. This box offers access from both sides of the trailer using dual “barn doors”. It is large enough to fit a pallet into and many other items all at once. We have many stories of when our equipment performed better than others – if you are in the market for dustless blasting system, make sure you talk to us first as we can help you make an informed decision and ensure you invest your money wisely and do not have any “post-sale” regrets. We have been in business since 1984 – our focus is “all things blasting” and helping our customers whenever they need it. Please contact us now for further information and pricing.